José is a professional mountain guide with more than 27 years experience leading and organizing expeditions from Ecuador to Argentina in the various the Cordilleras of the Andes. 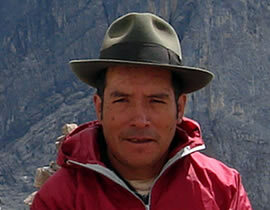 Few are as knowledgeable and experienced as he is in the mountains of the Cordilleras Blanca and Huayhuash. He is a member of the International Federation of Mountain Guides Associations (IFMGA) and the Peruvian Mountain Guides Association (AGMP). José has been the Chairman of AGMP. These days he also works as an instructor in mountaineering and trekking at the Center for High Mountain Studies (CEAM in Spanish) in Huaraz – Peru. I am a lucky man to have been born in one of the villages close to the beautiful Cordillera Huayhuash, and to have known these landscapes since I was a child. I have trekked their trails many times and have worked for different local travel agencies in Huaraz (the mecca of adventure travel in the Peruvian Andes) organizing tours to the different places in Peru. With lots of experience gained in tourism, computer programming, and languages, at 35 years of age I organize and coordinate all the details of the tours we offer in the Cordilleras Huayhuash and Blanca. I am fluent in English and I am an intermediate level French speaker. Quechua and Spanish are my first languages. 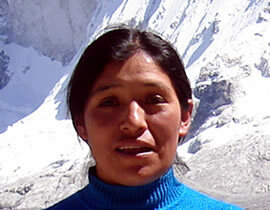 Also called Willy, he earned a diploma from the Center for High Mountain Studies (CEAM) in Huaraz. He is member of International Federation of Mountain Guides Associations (IFMGA) and the Peruvian Mountain Guides Association (AGMP). He has held the position of academic director of CEAM. 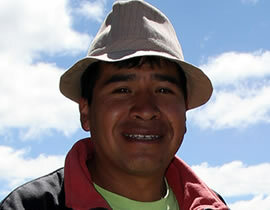 Willy was born in Musho, a village located directly below Huascaran, a mountain that he has climbed many times. 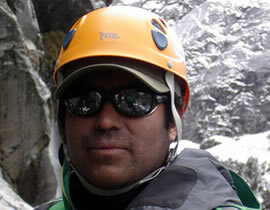 He is a veteran of many other successful ascents in the Cordilleras Blanca and Huayhuash. Since 6 years ago Wilfredo is an official trekking guide he studied at the Center for High Mountain Studies (CEAM) in Huaraz. 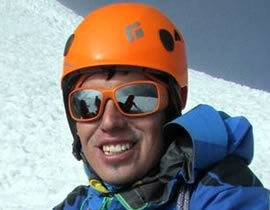 He is 27 years old and has guided many groups on their treks in the Cordilleras Blanca and Huayhuash. He has also climbed many mountains like: Pisco 5750m, Tocllaraju 6032m, Alpamayo 5947m, Huascaran 6768m, etc, all in the Cordillera Blanca, and Diablo Mudo 5350m in the Cordillera Huayhuash. Wilfredo is constantly training in outdoor activities. Languages: Spanish, Quechua and English. 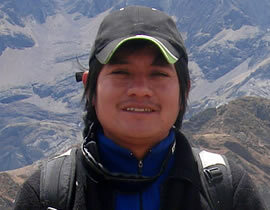 Official Tourism Guide, is specialized in high mountain, he has working in tourism field since 2003, he knows very well the Peruvian Andes specially the Cordillera Huayhuash and Cordillera Huayhuash, he has walked many times almost all the trekking circuits in these two mountain ranges, guiding expeditions from around the world. 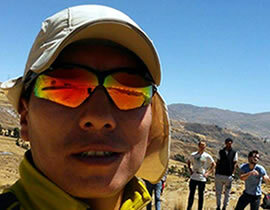 Native Quechua speaking Trekking Guide, also speaks Spanish and English; With enough knowledge of the local culture, has visited different regions of Peru. He is a professional very passionate about his native city, Huaraz, and Peru; from an early age he was interested in tourism and studied to be a Trekking Guide in the CEAM (Center for High Mountain studies), currently he belongs to the Association of Trekking Guides of Peru (AGOCP), and The Union of International Mountain Leader Associations (UIMLA), he has all the qualifications for work as a Guide, throughout his career he has stood out as a good worker in many agencies demonstrating his great passion to attend and advise travelers, guiding them to know new tourist places; his favorite destinations is the Andes of Peru are: Cordillera Huayhuash, Cordillera Blanca and Cusco - Machu Picchu. Official Trekking Guide. He was born in Yanama, Cordillera Blanca. He is 26 years old. He studied in the Center for High Mountain Studies (CEAM) in Huaraz and has been working in the tourism field around 10 years. He has climbed 5000 and 6000 m, peaks in the Cordillera Blanca and Cordillera Huayhuash, among these peaks are: Chopicalqui 6350m, Tocllaraju 6034 m, Alpamayo 5947m, Huascarán 6768m, Vallunaraju 5665 m, Pisco 5780 m, Ishinca 5530 m, Diablo mundo 5350m. At present he is almost finishing the high mountain course for the International Association of Mountain Guides (IFMGA), soon he will be an Official Mountain Guide. Languages: Spanish, Quechua, Italian and English. 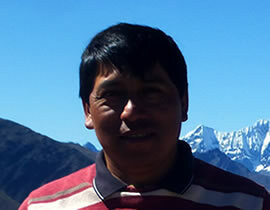 Amancio has over 25 years experience working in the Cordilleras Huayhuash and Blanca. These days he works as our trekking and climbing trip cook. He is a professionally trained mountain chef who is constantly adding new dishes to his resume. Our clients always enjoy the meals he prepares. She is working with us since 5 years ago, she is good Chef, her specialty is the Andean food, Deniss has been participating in many cooking courses and in every tours is improving her abilities. She has all the permits and certificates required by the Ministry of Tourism to work as a Camp Cook. Pablo is also a professionally trained high mountain chef who is known for his talent in preparing delicious and novel meals at the campsites. He began cooking at a young age and has now accumulated over 14 years of experience. 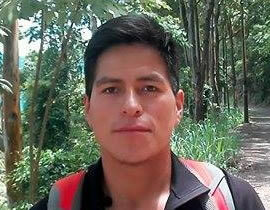 He is in demand and this has given him the opportunity to cook for expeditions in all the Peru.